In order to complete this cache, you must visit Garden of the Gods. No armchair Earthcaching is allowed. Please go to the site, to learn and answer the questions. There are three informational signs in the area that can assist you in answering the questions. A special thank you to Bret Tennis at Garden of the Gods Park for his assistance in creating, reviewing, and authenticating the educational information of the cache. 1. The Ancestral Rockies occurred approximately 300 million years ago. The erosion of these first Rocky Mountains formed the sedimentary Fountain Formation conglomerate layers, and the Lyons sandstones. 2. The Laramide Orogeny occurred approximately 70 – 80 million years ago. This phenomenon was caused by plate tectonics. The Pacific Plate dove under the North American Plate, causing the continent to buckle, and uplifted the Front Range, giving us a second set of Rocky Mountains. These also eroded away. 3. Pikes Peak was uplifted during a third mountain building time approximately 10 million years ago. It is currently being eroded by many factors, particularly ice. The bowls on Pikes Peak were scoured out by glaciers during the last Ice Age that ended 10,000 years ago. The Garden of the Gods Park is composed entirely of sedimentary rock layers, and is unique because the rock layers have been tilted upright and exposed in dramatic fashion. Each ridge and valley represents a different period of environment from the past 65 to 300 million years of Earth’s history. Erosion has sculpted these rocks into fascinating shapes. 3) a mixture of sand and pebbles called conglomerate. 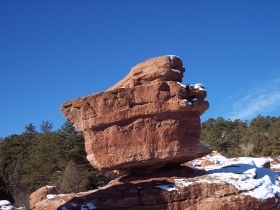 Balanced rock was exposed more than 60 million years ago when the existing Rocky Mountains rose. To make its current shape, the soft bottom layer of shale eroded much faster than the harder sandstone and conglomerate above. Amazingly, the narrow pedestal supporting Balanced Rock has held the 700-ton weight for thousands of years. 1. Identify, of the three primary types, what type of rock that Balanced Rock is. 2. Due to the uniqueness of this feature, estimate its height, widths, and circumference. 3. Since this is very abundant ecosystem for animals, what type of trees are found here? 4. Identify at least three animals that come here to gather food. 5. Who started photographing the rock for tourists and how much did it cost? 6. Optional: Please post a picture of yourself/team at the site with your GPS. Answers with "I dont know; Cant find it; etc..," or failing to answer the first four questions will cause your log to be deleted. Each person who logs a find must submit their own answers, no group emails. Please be mindful to remain on all paved and hard surfaces. Do not go off-roading or damage the natural habitat in any way. This is a learning opportunity, that many will want to join in on, so CITO and leave no trace when visiting. I do not reply to correct answers. So please log your find once you have completed the cache and submitted your answers. If there are any concerns, I will contact you. ALL LOGS THAT DO NOT HAVE ANSWERS SUBMITTED WITH 72 HOURS WILL BE DELETED. Tneqra bs gur Tbqf Ivfvgbe & Angher Pragre vf bcra sebz 9 nz gb 5 cz va gur jvagre zbaguf naq 8 nz gb 8 cz Zrzbevny Qnl jrrxraq guebhtu Ynobe Qnl jrrxraq. Obgu gur Cnex naq Ivfvgbe & Angher Pragre ner serr naq bcra gb gur choyvp.